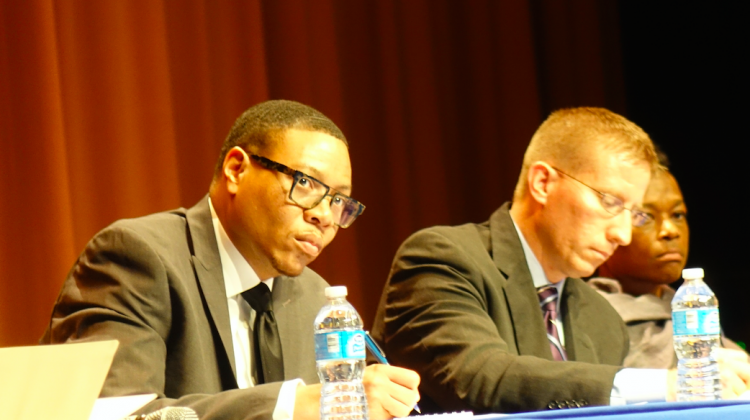 Indianapolis Public Schools Board approved a $28,000 performance-based bonus for Superintendent Lewis Ferebee at Thursday's board meeting. The additional pay is based on an annual review of Ferebee’s performance by the IPS Board. The school commissioners unanimously approved giving Ferebee 80 percent of a possible $35,000 of performance-based pay for meeting 11 predetermined goals in 2016-2017 school year. Last year Ferebee was awarded a $26,999, or 77.14 percent of the maximum amount of performance-based pay, for meeting goals. As part of the board approval, Ferebee received a base salary increase of 2.24 percent, or $4,701, for a new base pay of $214,581. The increase, combined with district retirement contributions and a monthly $1,000 automobile allowance, brings Ferebee's annual compensation to $286,769. The salary increase is retroactive to July 1, 2017. Ferebee's potential extra pay was originally set at $25,000 when he was hired in 2013. But last year the IPS board approved a new contract that increased the performance pay to a potential $35,000. That contract also provided a 6 percent raise. The performed-based bonus for the superintendent comes just days after the school board approved a new teacher contract that included an average raise of $1,019 or 2 percent for most teachers who had not received a negative evaluation this year. Teachers at the top run of the IPS pay scale, meaning those who may have worked for 20 years in the district, were eligible for a one-time stipend, not a salary increase. This year the IPS district earned a D on the state's A-F accountability scale. [1.1.2] Expand Innovation Network Schools and replicate and expand successful choice programs to provide a wider range of choice options for families. [2.8.2] Create a common local performance- based accountability model with interested partners that includes metrics for school culture and student growth. [1.6] Implement comprehensive, strategic grade configuration plan to improve student achievement by 2017, based on district data. [2.4] IPS will establish a facilities utilization committee to recommend strategic opportunities for supporting programmatic needs and student achievement by 2016, as measured by district data. [2.6] IPS will reduce its commitment to warehousing and supply to become a leaner more flexible organization by 2017, as measured by district data. [2.1] IPS will determine the most fair and equitable distribution of funds across the district by 2017, as measured by district data. [2.2] IPS will enhance financial transparency by conducting third- party auditing practices and publishing an annual report to bolster financial and in-kind support by 2017 (a baseline must be established). [2.8.8] Explore the feasibility of offering expanded and enhanced food services options for schools. [2.7a.1] Update Energy Management Plan to drive significant reduction in consumption in schools and district offices annually while preserving a high- quality learning environment. [3.4] IPS will employ best communication practices by consistently using a wide variety of modes and languages to reach 90% of target audiences by 2016, as measured by district data. Pursue effective communication outcomes as measured by objective data, including but not limited to customer satisfaction and constituent surveys. [3.2] IPS will provide, promote, and monitor customer service excellence to ensure a welcoming environment districtwide by 2017, as measured by district data. Consideration of software/systems that will support and track customer relationship management. [3.5.1] Explore mobility transportation options for targeted schools with mobility concerns for at-risk students. Academic Indicators: Graduation Rate (Current 72.1 percent; Target 75 percent). IREAD3 (Current 74 percent; Target 76.7 percent). College & Career Readiness (Current baseline year; Target 75 percent of high schools earn 100 points).